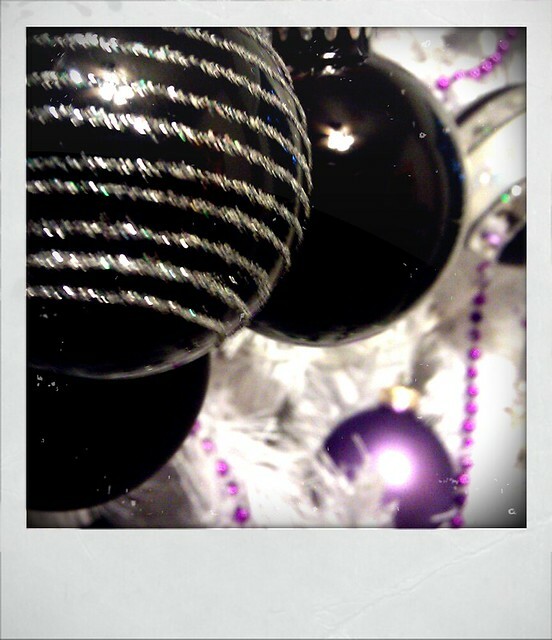 This year, we decided to dress up our little white tree in black silver and purple. While Nicholas was at work, the pugs did their best to stay out of the way and I got the tree all assembled and decked out. For the grande finale, once Nicholas got home, I crawled under the tree to plug in the lights... and *snap* ...*jingle*... *crash*... the sad little plastic base gave out and crumbled. Our little emo tree's now leaning ever so slightly against the french doors it was once standing in front of. An FYI, none of the major stores (or minor for that matter) have tree bases. But Amazon does! And Amazon ships fast. Thankgoodness!! So here you have it, the one photo of our tree this year. Taken while it was still standing.